With an a new design that resembles a classic mechanical metronome, the new KORG KDM-3 provides powerful, clearly audible tones and a variety of beat patterns and sounds. The KDM-3’s design is reminiscent of an acoustic mechanical metronome, except much smaller, making it a perfect fit for your tabletop, piano, or any practicing environment. Featuring a newly designed sealed speaker enclosure, it delivers powerful volume that exceeds its compact size, allowing you hear the metronome over the sound of your instrument or in a group setting. 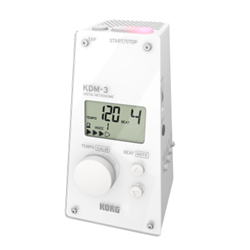 The KDM-3 features a variety of sounds including mechanical metronome , cowbell, rimshot, or voice and also offers 19 beat pattern, easy, one-touch operation, and a large display. Designed with reliability in mind, the KDM-3 also offers up 120 hours of battery life and a convenient Memory Backup function that will remember your settings in-between practice sessions, as well as an Auto Power-Off function.